A pack of delightful characters populate this entertaining book: there’s the outspoken wife Jocasta, the 18-year-old Batboy, and the adolescent known as The Space Cadet, not to mention the head of this ‘typical’ Australian family, the beleaguered narrator, a man seeking to justify his existence. Richard Glover chronicles the joys and trials of everyday family life in a series of amusing vignettes. For example, he gets to the bottom of “the list” Jocasta leaves when she goes away for the weekend; he documents the Batboy’s time-wasting study habits; he discovers that the way to shut up that obnoxious passenger on the bus is to speak in a posh British accent; he observes that we all speak in fonts and that these reveal quite a lot about our personalities; he invents the “staycation”, a way to save money by vacationing at home; and he constantly wonders what wisdom to pass on to his growing sons. Glover writes a weekly column for the Sydney Morning Herald and presents the comedy show Thank God it’s Friday on ABC local radio. Why Men are Necessary collects many of these stories. I thoroughly enjoyed this charming book, not just for its million and one roll-on-the-floor laughs, but because of the tenderness with which Glover observes commonplace events. At a time when news about family bonds seems desperate, it’s a relief to read of its celebration. Glover makes his case: such humorous, loving, caring men are indeed necessary. 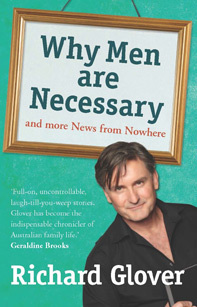 Why Men are Necessary, Richard Glover, ABC Books. Review first published in The Courier-Mail in December 2010.